SIGN UP: Get more news, insights and analysis of America’s education system; sign up for The 74 Newsletter. The difference between Hannah Williams’s old and new high schools was night and day. The Nevada teen had dropped out of her first school — twice. She was suffering from anxiety, dealing with a chaotic family life that shifted her in and out of homes, and feeling disengaged amid overcrowded classrooms and teachers who had little time for her. Williams got a second chance, but she is one of the lucky ones. Nearly three-quarters of high school students are stressed and bored at school, just like Williams was, a new national survey finds. Nationally, students agree. Only half of current high school students surveyed said their school did a good or great job of teaching them how to cope with stress. Hispanic students and students from low-income backgrounds were more likely to say they felt stressed-out by school. In fact, teens are even more stressed than adults, according to a 2014 poll by the American Psychological Association. Diagnoses of anxiety have also been on the rise in teenagers, with blame attributed to everything from smartphones to tests to gun violence. That lack of inspiration shows up not only as anxiety but also as boredom. 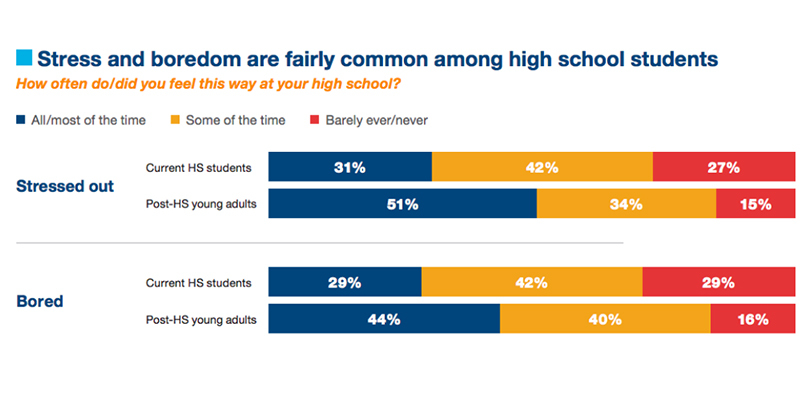 About 7 in 10 current high schoolers reported feeling bored in schools at least some of the time, with about 30 percent saying they felt bored all or most of the time. Students with poorer grades and from low-income households were more likely to report feeling this way. Disengagement, or boredom, is a problem cited in other research as well. A 2016 Gallup poll found that as students progressed through the education system, they were more likely to feel bored. Only 32 percent of 11th-graders said they felt engaged in school, compared with 74 percent of fifth-graders. The new survey, conducted online during the spring, asked 1,300 current and recent high school graduates how well their schools taught them skills like collaboration, self-confidence, understanding of others’ feelings, and conflict management. These are social-emotional learning skills that schools are encouraged to teach as solutions to problems such as bullying, stress, and disengagement. Social-emotional learning has been proven to boost graduation rates and improve academics, regardless of student demographics. Despite their feelings of boredom and stress, the majority of students surveyed said they think their schools are doing a good job of teaching other social-emotional skills. About 6 in 10 said their schools did a good or great job preparing them to work well with others, and nearly the same number said they were taught to have confidence and see things from others’ points of view. Nearly 8 in 10 students said their schools were doing a good job of making their learning environments positive, and the same proportion said their teachers were supportive. GO DEEPER: Get more news, insights and analysis of America’s education system; sign up for The 74 Newsletter. Disclosure: The Bill & Melinda Gates Foundation provides financial support to the Collaborative for Academic, Social, and Emotional Learning and The 74.